These photos have been supplied by Emily and relate back to our club excursion to Enfield Forest in November. We look forward to seeing members and visitors tonight for our last club meeting for this year. Members will be sharing a few of their highlights from this year, 7.30 pm at the Fed Uni Campus on the corner of Gillies St and Gregory St Wendouree. There are so many beautiful places to visit at the moment and we are spoilt for choice. Here are 3 photos from Bill, taken yesterday. And a few more from his companions. Field Nats Bill and Paul, visited several sites at Dereel on Tuesday – the Dereel Stone reserve, Swanson Road and Bliss Road reserve (east side). Unfortunately there are several gorse plants, some gladiolus and at least one plant of boneseed along the northern section. 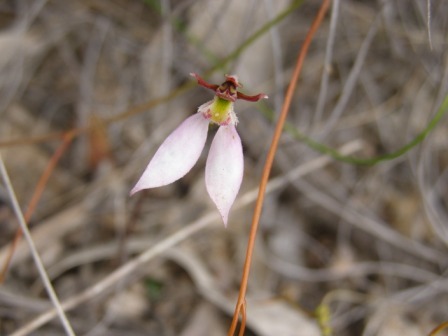 There was little out in flower at the Stone reserve, only two wattle species – Acacia paradoxa and A. myrtifolia and leaves and buds of helmet and mayfly orchids. The other two sites had good flowering examples of two orchid species plus flowers of nodding and trim greenhood orchids. Probably Sprinter is here if you subscribe to the six season calendar. On a recent trip out to the Enfield Forest Bill M. really felt spring had arrived when he saw Chiloglottis trapeziformis , Corybas incurvus , Pterostylis concinna , Pterostylis nana and the find of the day was a large colony of Cyanicula caerulea. In the 1960’s the Field Naturalists Club of Ballarat regarded the “Sandy Patch” at Enfield the best place to find winter-flowering orchids. The club will visit the Sandy Patch on Tuesday, 16 August, 2016 weather permitting. 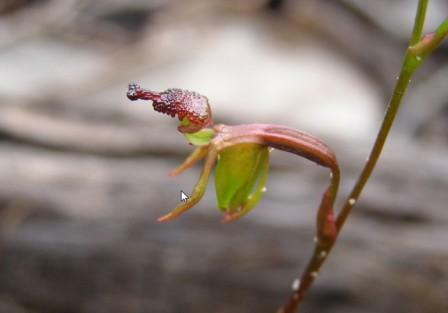 Parson’s Bands are appearing in the bushland around Ballarat. About fifteen were observed along Monkey Gulley Road, Scarsdale last Tuesday. Perhaps the visitors for the SEANA weekend saw some as well. 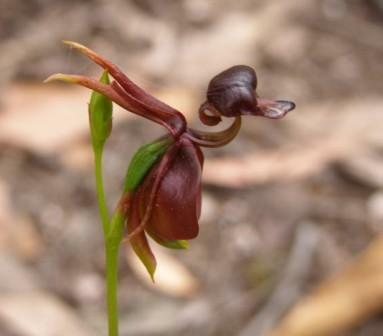 On recent excursions in mid November and early December we have seen two different duck orchids, Caleana major, Large or Flying Duck Orchid and Caleana minor, Small Duck Orchid.